Consider two analytical reports from CrimeReports.com. A number of oddities leap out, but most of all look at the scale on the X axes. It runs to 30,000 for San Francisco, and only 800 for Washington DC. 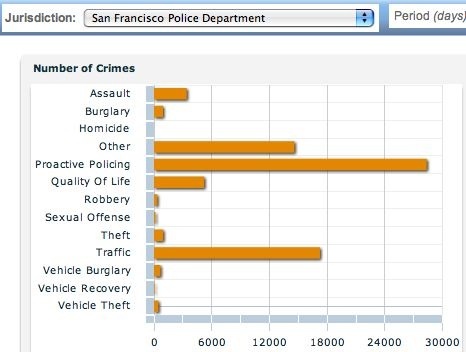 In absolute terms the numbers of thefts reported are comparable: 732 for Washington, 952 for San Francisco. But some non-reported categories from Washingon skew the comparison wildly. The numbers for Traffic and Proactive Policing, for example, are zero for Washington, but 17264 and 28356 for San Francisco. This information is for interest only, and is subject to error and change based on the validity of the data from the Department. Nor does the service invite or support this kind of comparison. To make it, I had to combine views taken separately from the two jurisdictions. Apparently there’s a problem with the Washington DC data. There cannot have been no traffic offenses or burglaries in the past month. But in this case, we can check for ourselves. The DC data is available to anyone. The San Francisco data certainly looks saner. But if you wanted to verify it, you couldn’t. The San Francisco data isn’t similarly available. What worries me a little, though, is that CrimeReports implementations don’t (so far) yield up feeds of the underlying data. I understand the reasons why not. But I think it’s crucial that citizens will come to expect such access, and will be encouraged to make effective use of it. It’s not Greg’s call whether to publish that data or not. Jurisdictions decide for themselves. 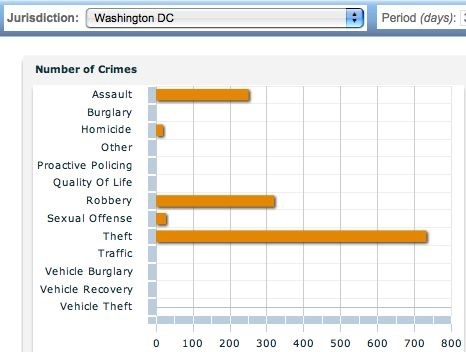 When data is publicly available, CrimeReports.com can base its maps and analytics on the same information available to everybody else. Otherwise, and almost universally so far, CrimeReports.com plugs into police databases behind the firewall, and produces maps and analytics, but citizens still can’t get to the underlying data. Greg says he is perfectly willing to provide such access, if police departments want him to. So far they don’t, though he expects this will change slowly over time. Meanwhile, nobody else can get to that data. That means, among other things, that in San Francisco, EveryBlock has been frustrated in its efforts to include block-level crime data in its hyperlocal news feeds. There are all sorts of reasons why police departments won’t want to publish raw data, and I can sympathize with some of them. Privacy, even when data are aggregated to block level, is a concern, given the many surprising ways in which deanonymization can occur. And misinterpretation is another valid concern. Personally I think that the benefits of transparency outweigh these risks. But it doesn’t matter what I think. Open access will happen because an administration (like DC) decides on that policy, or because a groundswell of citizen sentiment demands it. I haven’t seen an example of citizen demand driving the decision, but maybe San Francisco will be a bellwether on this issue as it has often been on others. that looks at some of the concerns about crime maps distorting the reporting and analysis of crime, with particular inputs from police analysts, academics and others. Also makes some interesting points about factors that distort such maps (eg ‘no-go’ areas, and why police stations will appear as high crime areas) and questions some of the motivations behind such initiatives. Ful program might be available on “listen again” service or similar. Previous Previous post: Should I visualize more weather data, or just build an ark?